Cooking a steak in butter on the stove produces a crisp outer crust with a juicy inside. This method uses a good amount of butter to give the steak flavor while creating a crust on the outside. Use only the fat from the steak initially to lubricate the pan, and cook the steak for a few minutes; after that, let the butter take over. This technique requires you to watch the steak closely and estimate your cooking time based mainly on appearance. But the end result is juicy, tender and worth the extra effort. Set the pan on a stove-top burner set to medium heat. Set the steak on its fatty edge in the pan; it should sit upright. Cook it until it produces a layer of fat in the pan; this should take about five minutes. Flip the steak gently with a pair of tongs onto one of its flat sides and cook it for another five minutes. Flip the steak to the other flat side, again using the tongs gently, and cook it for about another five minutes. Remove the steak from the pan. Pour off the grease in the pan. Wipe the pan with a damp cloth to remove all excess grease and save calories. Add enough butter to the pan just to coat it. While most recipes call for using about 3 tablespoons of butter with this technique, you can get by with less. Try substituting some of the butter with olive oil. Place the steak back into the pan. Sprinkle the top evenly with salt and allow the steak to cook for about six minutes. Baste the steak with the butter, using a spoon, continuously while the steak cooks. Flip the steak over with the tongs and salt the top of the steak. Cook the steak for about another three minutes while basting it with the butter. After cooking the steak, allow it to rest for about 10 minutes, or about half as long as you cooked the meat. Season the meat with more salt and pepper before serving. Do not pierce the steak with a fork while or after cooking to prevent losing juices. 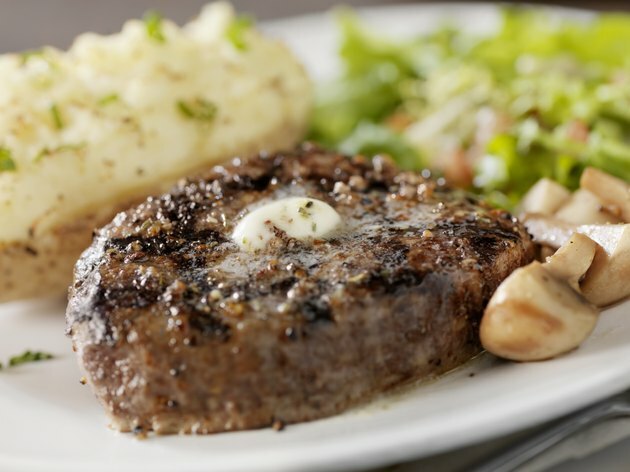 The Paupered Chef: The Butter Steak: What's the Best Way to Cook a Steak?